My Lords, it is a pleasure to follow such an expert and impressive speech from the noble Baroness, Lady Bowles, in moving Amendment 69B. 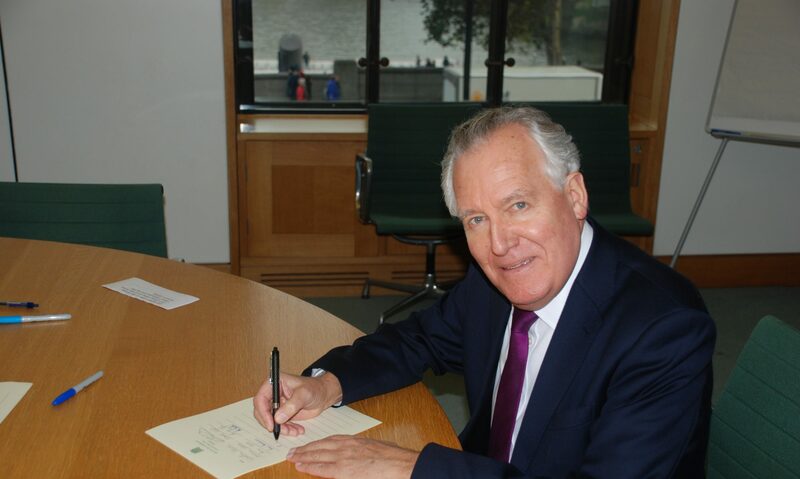 The amendment is supported by my noble friend Lord Collins, and I have put my name to it. It introduces a failure to prevent offence. “The banks are just not taking the rules seriously enough”. Yet, after all these strong words, what happened? Instead of the FSA—now the FCA—getting tough with the banks, since 2010 there have been only 10 convictions under the money laundering regulations, not one of them of a bank. It is therefore hardly surprising that there have been repeated money laundering scandals involving UK banks. There is simply no adequate deterrent or serious regulatory risk to make UK banks turn away profitable business that they are offered, and there will not be until the FCA starts prosecuting people and banks for failing to apply the regulations. By chance, I met a business analyst this morning. Although I did not know it beforehand, he happened to be an expert in this area, and he described London as the money laundering capital of the world. If he is right, that is shameful. The UK is woefully behind where it should be on holding banks and financial institutions to account for money laundering. HSBC was fined $1.2 billion in the US in a criminal settlement for money laundering, and just a few weeks ago it was fined $352 million in France to settle criminal charges for money laundering. Despite being a UK-headquartered ​bank, and despite being under investigation since last December by the FCA, HSBC has not yet faced regulatory sanction in this country, even though it has been named repeatedly in corruption cases, for example in Nigeria in 2012 and during the 2000s. No UK action was taken against HSBC in any of those cases. Earlier this year, HSBC was again implicated, with other British banks, in laundering ill-gotten money out of Russia. A failure to prevent offence for money laundering, as provided for in Amendment 69B, would make it significantly easier to hold large global banks such as HSBC to account for poor procedures and for turning a blind eye to handling corrupt wealth. Without this reform, as Jonathan Fisher QC, a money laundering expert, has explained, it would be difficult and clumsy for the FCA or any other agency to prosecute a bank such as HSBC because it would have to show that a director or some other controlling mind in the parent company in London knew about the alleged misconduct. Indeed, it would have to show that that director intended the misconduct to happen. This is an exceptionally high bar which makes it virtually impossible to hold large global financial actors such as HSBC to account in the UK. In my speech at Second Reading on 1 November 2017, I described a vivid context for this Bill: the massive money laundering organised from the very top of government in South Africa—the presidency itself—and the systematic transnational financial crime network facilitated by an Indian/South African family, the Guptas, and the presidential family, the Zumas. British-based financial institutions such as HSBC, Standard Chartered, the Bank of Baroda and other international institutions have been conduits for laundering hundreds of millions of pounds or billions of rands, mostly through Dubai and Hong Kong. The South African Parliament itself is in the process of holding a public inquiry into large-scale state capture involving even larger-scale corruption and looting of state-owned enterprises. On 21 November 2017, Mr Zola Andile Tsotsi, erstwhile chair of the state-owned electricity generator, Eskom, gave evidence under oath. What resulted is the first smoking gun implicating the President of South Africa, Jacob Zuma, who exerted shadow control over state-owned enterprises which have been exploited through large-scale looting and money laundering, from which his family and friends have benefited. He did this by deploying one of his nominees, Ms Dudu Myeni, a person near and dear to him—he fathered a child by her. Educated as a primary school teacher, in 2012 she was appointed chair of Africa’s largest state-owned airline, South African Airways. In early December 2015, the then Minister of Finance, Nhlanhla Nene, rejected her request to renegotiate a fleet renewal deal for SAA, because it smacked of corruption. Within days, the President sacked Minister Nene. Evidence before the South African parliamentary public inquiry showed that, as chair of the state-owned airline, Ms Myeni not only facilitated looting by the Zuma and Gupta families, but also sought to control, instruct and manipulate the running of another state-owned power utility, Eskom, from which the Gupta family, through an intricate network of companies, ​have siphoned off billions of rands, via various banks, including London-based banks which I am asking the British authorities to investigate. I am grateful to the FCA for the contact it has had with me to pursue this. First, Eskom chair Mr Tsotsi was ordered by the government Minister for Public Enterprises in February 2015 to refrain from “interfering” with the management of Eskom. He only chaired the Eskom board, after all—why on earth should he bother himself with holding to account the executives underneath him? This ministerial instruction, to put it simply, was aimed at stopping him scrutinising the decisions and behaviour of Eskom and instead ensuring he turned a blind eye to the corrupt award of multibillion-rand contracts to the benefit of the Gupta and Zuma families. According to the evidence at the parliamentary inquiry that same day in February 2015, Mr Tony Gupta phoned Mr Tsotsi, accusing him of not “helping us with anything”, adding: “We are the ones that put you in the position you are in. We are the ones who can take you out!”. A few days later, on the eve of the newly appointed Eskom board’s first meeting, President Zuma called Mr Tsotsi, instructing him that the board meeting be postponed, without even giving reasons. Less than a week later, Mr Tsotsi was instructed by South African Airways chair Ms Dudu Myeni to attend the presidential residence on 7 March 2015, where she unlawfully ordered the suspension of three of Eskom’s key executive members. President Zuma arrived late to the meeting and ordered that Mr Tsotsi go along with the plan, resulting in one of the most notorious examples of looting in South Africa’s recent history. This Zuma-Gupta conspiracy then left the door wide open for the appointment of Gupta stooges, who in less than 18 months had bled the power utility dry. It now faces bankruptcy and has been downgraded by international financial institutions due to governance failures. I am explaining the background before coming to the point about money laundering and the responsibility of UK authorities. Eskom has more than 471 billion rands in outstanding debt, the majority of which is guaranteed by the South African Government and owed mainly to funders outside the country. In October 2017, Eskom revealed to its largest shareholder, the South African Government, that the power utility only had 1.2 billion rands left in its cash reserves until the end of November 2017, when it should have had 20 billion rands. It is estimated that by the end of January 2018, Eskom will be running a deficit of 5 billion rands. Eskom’s virtually giving billions to the Gupta-Zuma syndicate through nonsensical consulting contracts, tenders for fictitious goods and services, and advances to allow them to buy the coal mines from which they then sold back overpriced, poor-quality coal is the underlying cause of what went wrong. Each South African state-owned enterprise has been looted using the same modus operandi by the same elite individuals at the very top of the chain—namely President Zuma and his family, and the now infamous Gupta family. They have placed cronies such as Ms Myeni in key decision-making positions in these public enterprises to ensure that all valuable tenders are siphoned off to the Guptas, and in return a cut is then given to the Zuma family. Hundreds of millions of pounds have been siphoned off these important public companies in a process that has been described by the South African media as “state capture”. What is more, well-placed South African whistleblowers inform me that UK financial and banking institutions have been used for the systemic transnational financial crime network run by Gupta and Zuma families. Then there is the shadowy figure of Mr Nick Linnell, a “Mr Fixit” who, in the late 1970s, operated in the illegal racist white minority regime of Ian Smith in then Rhodesia. He was unlawfully hired by Eskom, on Ms Myeni’s instructions, to assist in unlawfully getting rid of certain executives, thereby clearing the way for the corrupt capture of Eskom. It has now emerged that South African Airways, through dubious unauthorised payments to Mr Linnell, and working hand-in-glove with the remnants of South Africa’s notorious apartheid police, has deliberately targeted well-known anti-corruption activists. This has resulted in unlawful arrests, detention and torture, as part of a desperate attempt to silence these courageous men and women, to stop them exposing systemic state-sponsored corruption. By the way, last weekend it was announced that Dudu Myeni had been appointed as the special adviser to the Transport Minister and that she came “highly recommended”. I therefore hope not only that this amendment will be supported by the Government but that there will be an immediate investigation by the City of London Police, the Metropolitan Police and the financial regulatory authorities into all bank accounts held in London by any South African state-owned company. Can the Minister, in replying to the amendment, please give me an assurance that this investigation will proceed? Because of the South African Airways chair’s patently unlawful involvement with the Zuma and Gupta families, the authorities should start their investigations with the airline, which is known to bank here in London, to ensure that its UK accounts have not been used for the illegal laundering of moneys from the proceeds of financial crime in South Africa, and that payments from it into UK banks have not been used to pay off stooges who have unlawfully targeted corruption whistleblowers. The British Government must not permit any UK-based financial institution to be complicit in the plundering of state-owned companies in foreign lands, especially when that plunder affects the poorest of the poor. South Africa suffered enough repression over the apartheid years, and we cannot stand idly by while economic repression replaces racial oppression, serving the greed of corrupt leaders, when we have the ability to help stop it. The exposure of HSBC, Standard Chartered and the Bank of Baroda to the parasitic Gupta financial crime network is currently the subject of international ​law enforcement investigations from the FBI to our own FCA. Inevitably, when dirty money from a global criminal network infects one financial institution, it will sequentially infect a number of others. This is the result of what is known as “correspondent banking”—a term that I have just been educated in—which by its complex nature is often misunderstood. Correspondent banks are international banks that clear smaller, generally domestic banks’ foreign currency transactions through large financial centres. In practice, this means that one transaction can move through a chain of financial institutions from the point of payment before it reaches its intended beneficiary. This creates significant money laundering and terrorist financing risks because each bank in the chain has to rely on the other to correctly identify the customer, determine the real owner and monitor the transaction. In essence, the correspondent bank is only as strong as the weakest link in the chain. Umpteen domestic and regional banks will inevitably have been part of the money laundering chain of Gupta money. These include, in South Africa, Nedbank and Standard Bank; in the UAE, Habib Bank; in China, Citibank China and Bank of China; and almost certainly every well-known bank in continental Europe. In the UK, Barclays Bank, which has a significant presence in South Africa and Africa, together with Santander, which also has a global footprint, should be given a red flag warning to check their exposure to Gupta money laundering—both direct and indirect. It is essential that all UK banks refuse to have anything to do with the Guptas or Zumas. I hope that the Minister will confirm that that will happen and that the same warning is given to RBS, Lloyds and any other UK banks—indeed, any bank that has had any contact with the Guptas or Zumas, inadvertently or knowingly. I, for example, passed sheets of evidence from HSBC accounts to the FCA only recently. In those accounts are clear debits—hard payments—to members of the Gupta family here in Britain. So this is infecting the whole of our banking and the whole of our country. It is not good enough for those banks to argue that they reported suspicious transactions to their relevant domestic regulatory authorities. For over 10 years the Guptas have washed their money, aided by a labyrinth of correspondent banks—names that we would all recognise and probably bank with. Had these banks closed the Gupta accounts of their own volition, even five years ago, and not simply in reaction to recent political and investigatory journalist pressures, South Africa might not be on her economic knees today. In the same way as other companies such as Bell Pottinger, KPMG, SAP and McKinsey have been exposed and called to account for complicity in corruption for doing business with the Guptas, so too must these banks of ours. It is not good enough just to haul HSBC, Standard Chartered and Baroda over the coals, because the nature of dirty money is that it passes through a chain of banks from originator to beneficiary. The banks in between are also guilty, and if they do not act, they risk exposure and reputational damage of the kind suffered by HSBC. Look at what happened to Bell Pottinger: as a result, it went bankrupt. Next PostNext Time to talk about a one state solution?